What do you do when you have an old BMW 5-Series just lying around? Yeah, you could turn it into a decent Lemons car. Or you could transform it into a rolling jukebox that sprays fog and dispenses cold drinks. How come no one else has thought of that? 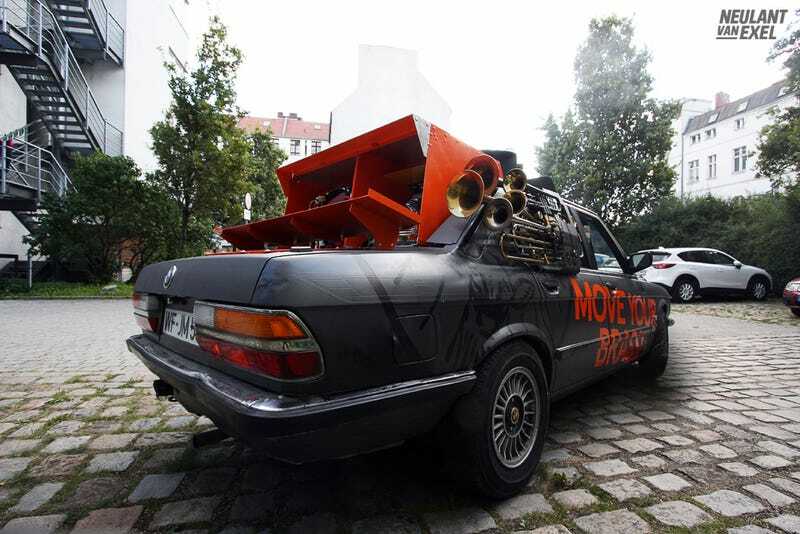 German artist duo Neulant van Exel turned this E28 into the "Brassmobil," a public art project sponsored by Jägermeister. It's kind of amazing. The Brassmobil features a full drum machine set with controls on the trunk, a disco ball inside, flashing lights, a fog machine, and a system that dispenses unspecified cold drinks, presumably Jägermeister. Not something to mix with driving, but lots of fun if you aren't. I would very much like to hoon the Brassmobil. Wouldn't you?